i enter her room. there she is. i have heard her voice. can recognize it even in deep sleep. her ability to emote, portray shades of meaning in anything she sings. a thumri. a dadra. a kajri. a bhajan. abhinaya in those vocal cords. a balasaraswathi, a kalanidhi narayan in a different mode. how does she do it? how effortless and easy it seems. i soon realized that beneath the simplicity of her gayaki [style] lies her virtuosity. swa means self and ra means light or to bring forth, meaning when the musician touches her 'soul' that music we say is 'felt' and when that happens, the song becomes rasavant [having essence] and is there for all to see. on april 6th 2003, i went to smt shobha gurtu ji and asked her if she could teach me. the next day i began my lessons. i had taken some apples with me. she took one in her hand. like a slender throat & a big voice'' . . . she said smiling. chathiya tharaka gayi re mori aali, piya nahi aaya . . . . . . .
i sat at her feet mesmerized. She is no more with us. And I need to say this. She was a performer par excellence. sur - means pitch. For the singer, the hand moves aiding the singing voice. raga meaning passion - is a type of melody in Indian classical music. ripples in widening circles . . .
taanpura is an instrument used by vocalist in Indian classical music. All above haiku first published in Simply haiku - 05. The 'Thumri Queen' passes away: Shobha Gurtu (1925 - 2004). Noted vocalist Shobha Gurtu died at her Worli residence in central Mumbai on September 27, 2004, following a cardiac arrest. She was 78. Known as the ‘Thumri Queen’, Gurtu's career spanned over five decades. Born in Belgaum in 1925, Shobha Gurtu hailed from a family in which melody ruled and rhythm had a shrine. She received her initial lessons in music from her mother Srimati Menakabai Shirodkar, a noted dancer of her time who also was trained in vocal music in the Atrauli Jaipur ‘Gayaki’ of Ustad Alladiya Khan. Later, Shobha had the privilege of receiving advanced training from Ustads of the eminence of Nathan Khan, in classical singing, and Ghamman Khan, in light classical and popular music. Her father-in-law, Pandit Narayan Nath Gurtu, the erudite scholar and musician, also gave her valued guidance and direction in her pursuit of music. The grand dame of Thumri was thoroughly steeped in pure Classical Music. But she was better known for her light Classical Music. Shobha Gurtu was considered to be in a class by herself not merely because of the unique qualities of her warm and sensuous voice that blended strength with suppleness and vigour with grace. It was equally much the unique combination of talent and soul that she brought to bear on her music. 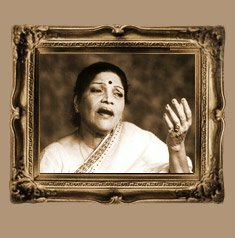 She evolved a technique that let her negotiate, with equal ease, everything from thumri, dadra, hori, kajri and chaiti to ghazal, bhajan and Marathi Natya Sangeet, with all regional and stylistic variations blended subtly.